Platform API is BBC Future Media’s new Salford based API team. Our mission is to make life easier for application and website developers who work with the BBC’s content, and to accelerate innovation in our online products. Platform API power all the BBCs product areas – BBC iPlayer, News, Sport, Weather, Children’s, Knowledge & Learning – as well as many external & partner products such as http://www.thespace.org/ and Youview. I’m in charge of the team and I’m looking for new people to join us. So I thought I’d give you more details about what Platform API will be doing. We’ve got most of the BBC's content available on our API – TV & Radio programmes, News & Sport articles, Weather, Market Data as well as covering syndication of the content to the BBC's business partners. 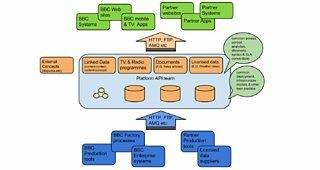 The BBC has been developing HTTP APIs for many years, but they’ve evolved independently and organically with the apps and websites (“products”) that use them most, and this has lead to them being far from consistent – we have quite a variety of approaches in syntax, semantics, aesthetics, documentation & access models. They’re also often incomplete – we typically implement just enough to support the functionality needed by our products at that point in time. The lack of consistency and completeness doesn’t make life easy for our product developers – whether they work for the BBC, our business partners or small independent development agencies or enthusiasts. Platform API is going to change this. We’re going to evolve the APIs to be more consistent by using the best approaches across them all, by reducing the unnecessary differences and by working harder to make them more complete. This way, they’ll be easier to learn and use for the product developers, and more useful to the products that use them next. Being responsible for this refreshed set of internal & public APIs will lead to many interesting technical and API design problems for the engineering teams to solve. Across our content set, there are varied sources with many thousands of new items published every day, and our APIs have to be able to respond to a large variety of aggregations and filtering requests from many different sites & apps. We have to discover and expose the relationships between our content items and relationships to external concepts (like places or people). And our APIs have to do this in real time at huge scale. We definitely have some hard data processing and manipulation problems to solve, as you can see below. We’ve been Agile enthusiasts for years. We are rapidly adopting Continuous Delivery practices and cloud technologies to help us scale, reduce coupling and develop more efficiently. We work extensively with cutting edge technologies such as RDF triple stores, NoSQL, Scala and Xquery as well as more traditional technologies like Java and SQL. If you’ve got a passion for APIs, are interested in offering resilient services at scale and you have API design, database, product management or engineering skills then I’d like to hear from you. Search for Platform API on the BBC Careers website. And if you’re a regular reader of the Internet blog, expect more posts from the team as it sets about its work.